Just like everyone else, I updated my iPhone and iPad once I was allowed to do so. The first thing that impresses me was not the flat UI people keep talking about, or the controversial faddish color John Ive fascinates with, but the way and the philosophy of organizing its visual information. This revolution may open up an era in GUI. “There stood a mountain, on which there used to be a temple, in which there was a room, in which there’s vat, inside which there’s a plate, on which there’s a bowl, in which there stood a spoon, in which there a jujube” (“从前有座山,山上有座庙,庙里有间房,房里有个缸,缸里有个盆,盆里有个碗,碗里有个勺,勺里有个枣”). This is the Chinese traditional mini-story that I constantly think of when I’m navigating the new iOS system. What I mean by this, is unlike any previous iOS system with the animation always growing gradually from the center of the screen no matter where the icon you hit is located, the animation in iOS7 is rather fluid and actually convinces that you are navigating in a 3-Dimentional space. That is, for example, when you hit the App icon on bottom right, the center of the transition is growing from that exact icon on bottom right. 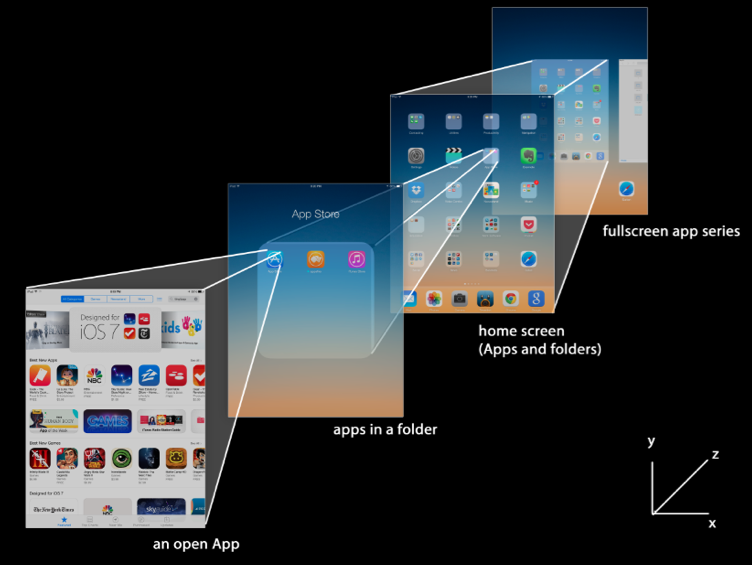 The perception of the additional z axis in the 3-D digital space even reinforces when you begin with the fullscreen app series, then tap an folder on the home screen, then tap the application icon on the folder until this app is completely opened (See Image 1). 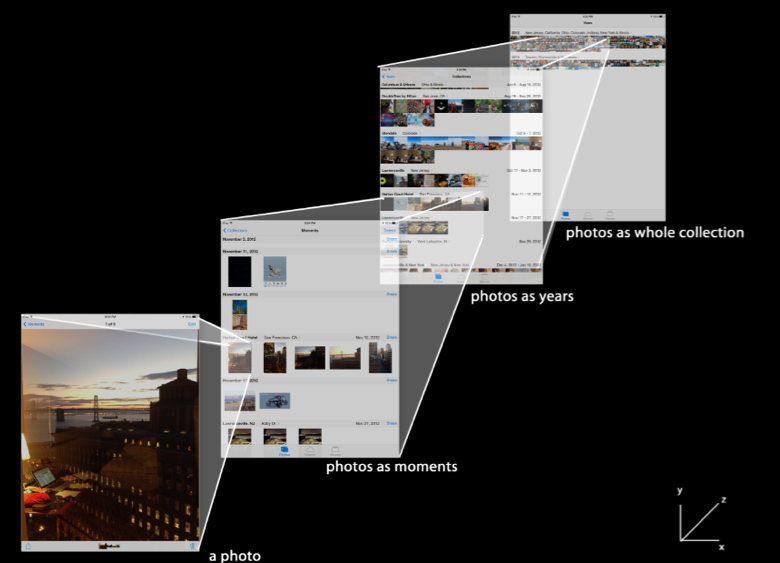 Another example is indicated in image 2: in the Photos app, you will need to keep zoom-in seamlessly from the whole collection of photos screen to the photo screen. It’s the same experience when you are using Google Earth to look for a specific house (this house is like an opened App in iOS 7) on a street by keeping zooming-in from the rounded earth in the dark universe. Why this is a breakthrough in GUI history? I think this change might be a breakthrough of opening an era in the Graphical User Interface history. See image 3, it’s a traditional way of how the user interface is organizing information: there’s a folder, and we open this folder; no more than a second, another overlay pops up on top of the previous one; then you open a file in this folder; immediately another layer open again… It mimics paper forms and this is because we still have – unconsciously the paradigm of a printed document in our heads. The system lives on in the ubiquitous notions of “file” and “page” because we haven’t truly understood the degrees of freedom that today’s technology gives us. This predefined of data model and process has been and is still prevailing for a couple of years since we were introduced the GUI for a computer system. Then the first game changer came: Windows (phone) 8 operating system. I always admire Windows 8 as one of the boldest steps in the history of user interface and interaction although it has some inherently critical faults. It completely changed how we perceive and process information on an operating system: it is almost a flat hierarchy, just like an endless canvas containing every single thing on top of it (Image 4). It has no folder or allows a folder, so there’s no such another layer deep deep down. All the relation is about neighborhood but not hierarchical, and apps are equally scattered on this canvas. 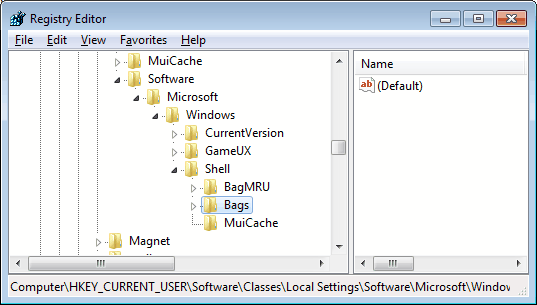 Though Windows 8 embraces the philosophy of authentically digital and removes the physical limitation of the real world, it doesn’t seem to be the right direction of the future GUI. The reason is it creates a lot of usability problems. I don’t want to expand this topic in this article, but one example is users have difficult times in finding out a file neither by scrolling this endless and plain canvas nor searching the name in the search box, because for a lot of time users tend to remember the location of file instead of its predefined name. Another way of being not constrained by the lack of real life’s experience but still embrace the power of digital technology, is to generate another dimension on this x-y-coordinates world. The iOS7 does this. The depth of the information is no longer defined by the paradigm of “document-style” UI, but it magically creates a z-axis in this limited 2-dimensional device screen. If you happen to use Prezi – a tool to create presentation other than Microsoft Power Point, you must be noticed by the scalable space of the contents. In both Prezi and iOS7, users navigate on a scalable canvas to locate their destination. The system is relatively flat as a canvas, but still communicates the depth of the hierarchy as a 3-D space. This might be the future of how we design, organize, and interact with the GUI information. I’m impressed by that Apple adapts it without completely changing what is existing in the old system. This entry was posted in Uncategorized and tagged HCI, Information Architectue, Interaction Design on September 23, 2013 by Zewen Liang.